Thank you for visiting Cool Creations Homemade Ice Cream. We are now CLOSED for the season. Locally owned and operated, Cool Creations Homemade Ice Cream offers a variety of delicious treats for the entire family. Whether you're in the mood for soft served, chocolate dipped bananas, homemade cookies, brownies or ice cream pie, we can satisfy your craving. 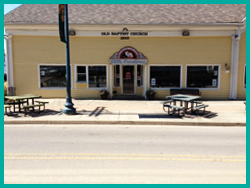 For over 20 years, we have been Lockport's number one source for all things ice cream. Bring the entire family in to enjoy a cone or sundae and make memories that will last a lifetime. With plenty of flavors and toppings, we can serve you up something exactly to your liking. Stop by for a frozen treat today! We look forward to seeing you. We are now closed for the season, we look forward to serving you next season!